The aim of the WP1 is to provide requirements and recommendations to be taken account in development and evaluation work packages. This is achieved by identifying and analysing of best practices and results from existing studies and projects at national and international level. Further, the analysis of the existing railway accident databases will provide the recommendations of database content. Harmonised accident data will provide the base to the risk analysis tool and framework which is developed and applied the SAFER-LC project. The aim of WP2 is to enhance the safety performance of LC infrastructures from a human factor perspective, making them more self-explaining and forgiving, designed to take into account the needs of different road and rail users, and especially issues related to vulnerable users. Develop a “human factor” methodological framework based on existing data sources and analytical tools that can be verified and improved in the development and implementation phases of WP4. Propose the design of innovative low cost LC safety measures that can include technological measures (for example based on vehicle-to-infrastructure and infrastructure-to-vehicle V2I-I2V) or non-technological measures (for example LC design and layout, passive warning systems...), encompassing road users (vehicle drivers and vulnerable road users) and rail users (train drivers) and people working on or in the vicinity of the LC . The goal of WP3 is to develop technological solutions to improve safety at level crossings as well as at working zones through sharing information and giving warnings to trains/vehicles approaching/arriving to level crossings and to workers at or near train passing zones. Testing newly developed and readily available smart wireless sensing technologies for monitoring of LC infrastructure. The main objective of WP4 is to evaluate the positive and negative impacts of lab tests and field implementations executed within SAFER-LC project e.g. in terms of usability and user acceptance, railway capacity (possible effects on maximum permitted train speed), road capacity (possible effects on car speed limits and/or closure times of level crossing), safety and environmental benefits. 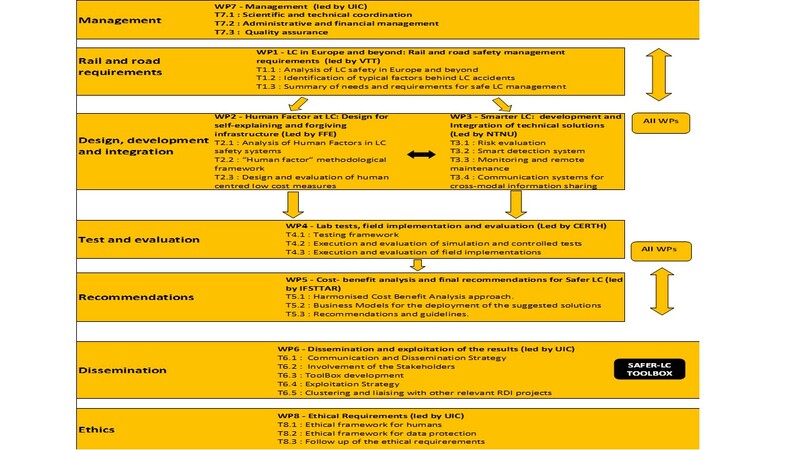 The main outputs of WP4 include the guidelines for the implementation and evaluation of the proposed solutions (lab tests and field implementations) that will be tested within SAFER-LC including the data collection framework (task 4.1) as well as the execution of the proposed solutions and the analysis of collected data (tasks 4.2 and 4.3). The aim of WP5 is to perform a cost benefit analysis and provide final recommendations for future international standard in Rail and road environment for safer level crossing. This WP will then output a concise set of recommendations on technical specifications and human processes, as well as organizational and legal frameworks required to implement the elaborated innovative solutions. The established recommendations are also to be fed into the relevant standardization framework. The objective of this WP is to disseminate the results toward the road and rail infrastructure managers, roads users and rail operators, road and rail providers for navigation and signalling systems, scientific community, standardization organisation and public bodies. Dissemination to a large audience of the public results. Dissemination of the results toward a targeted community outside the project. Exploitation of the results in the relevant framework. According the dissemination strategy, a set of actions based on very usual communication tools such as web site, private workspace, and brochure will be developed. The second goal of the WP addresses more specifically the audience that is targeted and will be based on participation to international related events/meetings to exploit and disseminate the non-sensitive results as well as the organisation of a final conference. The final objective is to exploit the toolbox that is going to be developed within the project and to ensure the viability of the project results. Ensure an efficient project management for the whole consortium and making sure that the project objectives will be met within the given budget frame and schedule. Set up project specific management tools and procedures with the aim of ensuring a proper and accurate reporting and accounting to the Commission. The objective of WP8 is to ensure the necessary confidentiality and respect of privacy by establishing a set of principles and procedures to guide the partners to achieve the goals and objectives of the SAFER-LC project. This framework will outline the obligations of each of the partners through all phases of the project regarding human aspect and protection of data. 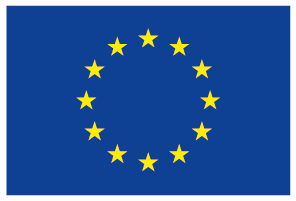 Strict accordance with applicable international, EU and national law, especially the EU directive 95/46/EC is guaranteed and any related updates will be observed.